Our previous post somehow only covered the first five days of our trip. It still seems bewildering to know in only five days we went so far and saw so much wildlife. If you missed the previous post, which did have pictures and stories of polar bears, just click anywhere on the first sentence. One amazing aspect to this trip, as I mentioned briefly in our first post, is the connection traveling through the Arctic has to history. On the afternoon of the last day from our previous post, August 31, we made our first real historical stop at Fort Ross. Our landing was at a site that used to be a trading post for Hudson's Bay Company. A vestige to an older time when forts on the edge of the frontier were the only place for travelers or locals to come for supplies, these remote trading posts looked a lot like what you see in the photo posted here. They were a place natives could come and trade furs for things like knives, beads, needles, blankets, and other such helpful tools. Since I do not know much of the Hudson's Bay Company and it is quite extensive, I posted a link to click on that tells all about it. Now this building has been refit to serve as a place hikers, travelers, sailors, etc can stay when they need a shelter. Inside there are supplies for cooking, food, beds, a heater, and anything else that might be needed to stay alive in the Arctic. Oddly enough the building locks from the outside. Why might you ask? To keep out the polar bears but allow access to humans. Looking to the photo, you'll notice on the ground are beams that slide into place as locks which befuddle a polar bears curiosity, keeping them safely outside. I naturally found the historical and the current use of this building to be pretty neat. To walk in such a secluded part of history felt amazing. As always part of every excursion is the chance to wander around and explore. I have already cooed ridiculously in the last post about how much I love the tundra. I laid down, because that is what I love to do in tundra, and took this shot with the Arctic cotton grass as the star. Not only is there a uniquely fun semblance to draw between cotton grass and Dr. Suess's Horton Hears a Who, but the coloring of the tundra in places like this was captivating. Just in case you're wondering what is growing on that rock over there, this stuff is everywhere in the Arctic. Lichens of all different colors are growing on pretty much anything that stays put long enough for it to grow, which apparently takes some time according to the experts with us on the trip. They are also, along with much of the history, on a long reading list of things I want to learn more about. There will be a few pictures of different lichens we saw along the way. We both enjoyed taking time to look at various objects with lichen growing on them, but Sarah especially loved seeking it out. Unfortunately most of our excursions gave us too little time to enjoy all of the many sights to see in the wide variety offered by these new landscapes to us. The next day, Sept 1, we had a day at sea transiting the Boothia Gulf as we made our way towards one of the biggest goals of our trip - the Fury and Hecla Straight, for which our trip was named. It was discovered in 1822 by William Parry while he was searching for the famed Northwest Passage. Parry was forced back by ice gathered in the straight but he correctly hoped and thought the straight could be a way through (as mentioned previously there are a few routes through). He named the straight after his two ships, the HMS Fury and HMS Hecla, adding a firmly defined portion to the Canadian Arctic map. As one can imagine even from just Parry's account, the main problem with this straight is it is often either filled or blocked off by ice. It would not be until over 100+ years later that the straight was finally traversed by a modern day ice breaker, proving Parry correct by the sea. Our expedition leader gave us numerous updates on the ice gathering at the mouth and exit of the straight, showing us how it shifted and changed even in the span of hours. As it was a highlight of the trip, these talks embraced the hope and expectation of making it through the straight but only if it was safe with every opportunity to make it out on the other side as well. Traveling through the Arctic is a tenuous balance of flexibility in which one must allow expectations to meet the realities of the ever changing environment. I enjoyed the mystery of not knowing what might come with our voyage, in attempting to pass a straight that had not been done by a vessel like ours in six years due to the unpredictable ice. Really amazing to be on such a voyage as this one. While we traveled throughout the day we were given the opportunity to hear from many of our Quark experts on numerous subjects. These talks were all illuminating and a great way to sit back with a tea or coffee to learn. This is shown in the riveting picture I posted above of the lounge where all talks were given. Our first talk was on the Mystery of the John Franklin Expedition, a subject on which we will talk about in a future post some more. Our speaker was our boat's historian Jerry Kobalenko, who also happens to be a man who has traversed a good portion of the Arctic on foot, skis, or in a kayak. Seriously, he's an endurance hoss and I feel like that's saying something coming from us. More on the story later. After digesting some serious history and theorizing on the mystery of dead explorers, we then turned to the topic of Birds of the Arctic by our boat ornithologist Liliana Keslinka. A nice change of pace from hearing of people who most likely died from lead poisoning or starvation to learn about the resilient birds that can live in the Arctic. With a break for lunch and some other activities (sometime soon on one of these posts we will definitely talk about the food!) we then all gathered back in the lounge to hear from the guy who could tell us about the lichen and the rocks - yes, a geologist. Wolfgang Blümel knows more about rocks than most of us probably know about almost anything. He was happy to tell us we were sailing between some of the oldest rocks on Earth, most of which is known as the Canadian Shield. Pretty cool stuff and as already warned we took lots of pictures of sweet looking rocks while we were up in the Arctic. At some point in the day we also watched a documentary called Atanarjuat: The Fast Runner. More information can be found about the movie by clicking on the link but its main significance is being the first movie to be written, directed, and acted entirely in Inuktitut. It is a very good movie and worth a watch when you want some Arctic flavor in your movie viewing. If you take a moment to look at the picture of the map I took above, you'll see near the end of our day of lectures we were getting close to the moment of truth with the Fury and Hecla Straight. As we neared the straight we started seeing a lot more ice, the most significant of which was a huge flow directly in front of our boat. One of our guides spotted - A POLAR BEAR! If you read the last post you will know how excited we were to see our first polar bear, and each one after our first. If there is anything that can trump those experiences, which is tough when including our first mom and cub, it was seeing a male polar bear ON THE ICE. Knowing polar bears prefer the ice and all of the other interesting tidbits we have learned about these wonderful creatures, I think at the end of the day they are simply more majestic to behold on the ice. Look at him in the picture below. He's just staring down our cruise boat with not a fear in the world. He sat. He sniffed. He walked around a little bit. He sat some more. And then he wandered off into the ice. I personally think he was sauntering off so he could sneak up on the boat later and pick off some easy food. And how I can say for sure that did not happen? I show this nice picture of the sunset for a few reasons. It was dinner time but at this point in the trip I had learned a few things. Always take the camera and binoculars everywhere you go. Yes it is awkward at times but when there are some ice flows with a beautiful sunset and there is nothing to hold you back from just walking out on deck to enjoy it. As mentioned earlier bears love ice, and well somewhere in this picture there is a bear swimming alongside the ice (maybe the same bear still sneaking us?? And sorry b/c it's pretty far away)! It was late and it was difficult to see the bear so just the few of us outside enjoyed this rare sight. We watched as this bear roamed the ice and then just swam and swam and swam! We kept thinking it would get back out but it swam until we could no longer see it and the fading light gave us no more to see. The bear was out there somewhere and he just kept sneaking. Nothing like going to bed after seeing a polar bear swimming alongside the boat. Now at some point and I think this was it, we experienced our first bout with THE weather. See how I called it "THE" weather instead of just weather. That's because THE weather can decide to rock my boat, and not just metaphorically. No reason to go into it too much but twice on the trip THE weather took it to me beyond where the scopolamine patch could help. I wish I did not have to take the drugs but they help me enjoy these places on water and in motion. Usually I can tell when this happened on the trip as there is a nice blank page in the journal I was keeping where there should have been memories written down. No worries though because Doctor Sarah was there to help me and keep me company. I believe I missed a talk or two during my bout with THE weather but that is what happens sometimes. 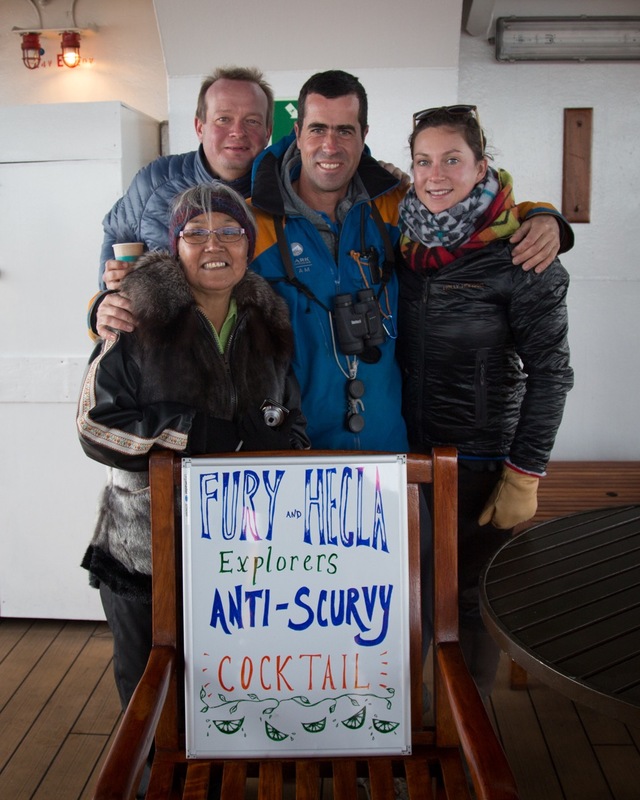 The crazy part about being lucky enough to pass through the Fury and Hecla Straight, with all of the build up and historical significance, was when we snuck past all the ice and made it to the straight it was night time, so we slept right on through to the other side. This was of course due to the moving of ice and the chance that it could shift at any moment and block either end of the straight. So when our captain saw the opportunity to move on through he took it. Probably THE weather was a factor in this decision as well. This means no pictures of the straight itself but The weather subsided enough we were able to get off the boat for a little bit for a nicely rough and wet zodiac tour of the Labrador Channel near where we exited the straight. So on the 2nd of September we jumped in our zodiacs jostling on the waves. We are taught to watch our step and told to step in sync with the waves while under the sailor grip with people in the direction we are stepping. Every zodiac pair, they pair us up for safety, comes back with their own stories from exploring. We came back mostly haven gotten our butts kicked by THE weather, but not to worry for our yellow parkas kept us safe and dry (mostly). Sarah did spot one ring seal and there were many really spectacular land formations to see that I apparently took no photos of with my waterproof camera. Hmm. After a little more boat time and most likely some hot showers and soup with lunch, we went out on the back deck for an anti-scurvy drink. You can look at the picture of some of our Quark staff from the trip modeling sign for the drinks. something. The event was a nice way to gather folks outside for fresh air and a nice vitamin C packed drink, which is also a fun connection to the history of the explorers who greatly needed it. Some of the passengers felt the taste was a little odd, but I drank a few with quite a bit of enjoyment in the cold with Arctic air filling my lungs. Although I can still not tell you exactly what was in said drink. With our afternoon anti-scurvy nicely tucked away in our bellies we all jumped into zodiacs again for our afternoon excursion to Ormonde Island. Note: Sarah just told me I have this wrong and anti-scurvy happened after our afternoon excursion. Well. I'm not changing it. Believe what you will. You have already seen some great shots of what I'm referring to as Investigative Sarah. A good seventy to eighty people could walk by the things she chooses to stop and search. I know as I watched it happen a few times. One fun thing about going for walks in a place like the Arctic is most of what you see being so exotic and unusual compared to what we are used to seeing. But as you have seen and heard from our first post and in the photos today, the Arctic does host its own sort of normal. In the first of our photo shoot Investigative Sarah, she is depicted stopping to pause with some Arctic rocks that at one point in time did what I like to call the lava dance. I no longer have access to Wolfgang to ask him for a detailed explanation, and as we joked on the boat there is not room here for Wolfgang's explanation for how this happened to the rocks would be. I do know for certain it had to do with lava. They made for a nice spot to stop to admire nature's beauty, while I admired my beauty as she was gazing at lava rocks. a bit and here on Ormonde Island you can see one of the reasons we liked it so much. The cotton grass would randomly appear amongst giant rocks waving in the wind as it was the most casual act in the world. For our next shot Sarah is caught red handed and in full detective mode. As I have said in our last post, we would be walking along and suddenly come upon a spine, carcass, skull, rib, socket joint, or some other animal remnants left where some predator had finished with them. And there they had remained most likely undisturbed for any untold number of years. In the Arctic there is a special preservation effect which makes telling how long something has been dead very difficult to tell. I am not sure what exactly Sarah had discovered but I was thinking perhaps the skull of an arctic fox. Then there is the final shot for our Investigative Sarah shoot. Sometimes when a waterfall is discovered a person can be tempted to put a feminine beauty in a swim suit next to it in an attempt to draw the beauty of both objects together for some greater portrait. Or it is just an excuse to get a girl in a bathing suit. And I am not saying I did not maybe pitch the idea to Sarah when I saw this waterfall, tiny as it may be. But come on, look at her in that red Mustang float jacket in her cute winter hat. If you cannot hide the beauty of Sarah with all of the cold weather gear she is wearing, how can you reveal it more by taking it all off? Just a thought I had. During our walk, and yes as an interruption to our photo shoot, we would stop and listen from the experts on various intriguing locations. In the next photo Jerry is seen puzzling out this man-made rock structure pictured with him. His assessment was the structure had been used temporarily as a shield from the weather for a short time. The person would have stretched skins across the rocks where Jerry is standing toward a big rock we were standing on which would have been the second wall and part of the roof along with the skins. Maybe a nice summer home! Speaking of strange looking rocks... while Sarah and I were climbing up to look around to take the nice landscape shot you see, we came upon these crazy triangular images. Wolfgang said they were natural, not made by humans, but it was quite unusual finding them really close together. Well there are probably a number of geographical phenomenon Wolfgang can explain that I end up chalking up to mystery. He's probably right, which if he is, sort of makes the triangles even more amazing to me. At this point I would like to share four words. Our first community visit!! Igloolik. It is a good time to mention the word igloo does not actually mean what most of us have come to believe. A nicely rounded house made out of snow and ice comes to mind, maybe some light coming out of the door. If you clicked on Acacia Johnson's link in the last post you saw a beautiful photo of what I am picturing in my mind. But it literally just means house. So Igloolik means "a place of houses." Click on the city name above to learn more about the community. them was high on the list of most of us. Igloolik did not disappoint on this count and virtually every person we met was willing to talk if we were willing. It was fun asking about how they lived their life or where they had traveled to while they asked us about where we had come from to anything else that interested them. While we were waiting on the school bus to come back to take another group on the tour around town, one of the passengers from the boat had convinced a man to take her up to the cemetery. We jumped in the truck and headed up the hill overlooking the community. Most communities like this were converted to Christianity by missionaries, and the cemeteries are the most visual confirmation of this fact. I will talk more about the faith of the local communities we visited in a future post, which was never as cut and dry as simply Christian. The personalized cemetery tour ended up earning us two things. One was a nice long walk back down to the town which was good even when it started lightly raining. The second though was the time it took to see the cemetery on a personal tour along with the walk back cost us jumping on the tour bus which was able to reach a few sites we could not reach via foot such as a whale carcass that had washed up on beach. Oh well, we still hit the main points within walking distance, like the church I am standing in front of with my flash yellow. This church was not open but as a man who has given his life over to the ministry of Christ I took special joy in seeing what God has been doing in the Arctic for years. So fascinating and unique. medical resources. Here is a picture of her and a few of the passengers from the boat peering in the windows of the Igloolik medical center. While Sarah was given a short tour of the building I waited for her out in the waiting room area to read all of the flyers hanging on the wall. Some of these will be added to the link of photos we share at the bottom of this post, but one of my favorites is a beluga/narwhal duo non-smoking sign. It was fun watching Sarah's excitement when we would discover a clinic like this one open and she could see their facilities. I suppose it was pretty close to the look on my face when we turned the knob on a church door handle and it opened. especially during cold dark winters, and usually some art venues. But in our brief Arctic experience no town came close to offering a futuristic space building like Igloolik. This is a science research center and they opened the doors for us to come in for a short tour and talk. They do all sorts of research in the area but of course most of what I recall from the talk was their research done with animals in the Arctic. While I did not ask outright and the scientist sharing with us did not offer any input on the subject, I have my suspicions their building is a secret spacecraft of some kind from another galaxy. I asked about the shape of the building to try and ferret out a response but she quickly gave some corporate answer. Sometimes it is best to hide the truth right out in the open, as also seen in Chicago with the magical bean "sculpture." Ya right. Since I know most of our readers will be super excited about Investigative Sarah I have added here one of our outtake pics from the shoot. Inside the science spaceship they had a polar bear skin for purposes of talks and as an amazing display model. Not only does this offer for a fun photo op but being able to get this close to the polar bear also gave us a real chance to see just how completely massive these bears grow! There will be some full length shots in the photo link to show this bears full size, but just look at the size of the head compared to Sarah. Yes she has a tiny head compared to the legendary Baddorf sized heads, but this bear could have easily call her head bite sized. creative people and their truly special forms of artwork have become recognized all over the world and is sought out at quite high prices. As communities who have truly only ever found their prosperity through hunting this brings a truly needed new form of revenue into the Arctic communities, but it is not without some caveats of major concern. As a people who live in lands with very few natural resources outside of the animals that live on the land and in the ocean near them, almost all of their artwork of course derives from some form of animal base. For instance, there are no trees growing to make paper, and so dried animal skins becomes their parchment or canvas. While some of this is changing due to access of having paper and other resources brought into their communities, it is still expensive and quite a process. And it does make sense for a community that finds its life source from the ocean to use every single part of a whale. After harvesting the whale for the much needed blubber and meet, would it then be better to leave the bones on the rocks or to carve something from them to generate further income? But a most obvious concern comes from waters that have fallen victim to over whaling, not by Arctic peoples, by Europeans and most everyone else who were doing the same anywhere else whales could be found congregating. For the most part this has stopped but there are still some major issues in allowing populations to rebound or poaching for particular animal parts like the valuable narwhal tusk. Due to a narwhal sinking when killed often a hunter will end up having to kill ten to twenty just to successfully retrieve one narwhal. There are obvious moral concerns which at this point have been surging in most readers minds, hearts, and deep within our souls. In this realm each person seems to come to their own end. From the trophy hunter with stuffed heads hanging on their wall to the person who has gone full vegan to avoid even eating animals or using their products at all. Most obviously we could not in any way try to impart whatever our values might be on a community that would literally die if they tried to exist in another way. You should have seen the price of food in their stores where some communities get one shipment of food per year! So there are options but we have to be honest when we would attempt to advise a people who live in such a climate and culture. To our and everyone's (well truly not everyone) else's great relief and even perhaps to hold us accountable when our convictions at certain moments might fail, there are laws about what one can bring back into most countries. Those who are for the protection of animals, would be proud to know the United States is actually more strict than even the guidelines set forth on these issues by a group called CITES. Anything made out of any marine mammal (whales, seals, polar bears) would be extremely difficult to bring back in the country if not straight up illegal. The two main animals from up high in the Arctic that are on the list of things you can bring back are the Muskox and Caribou. Mostly this has to do with the number of animals alive and how well the populations are thriving, though I am sure it's much more complicated than such a short comment can offer or I even have researched. Sarah and I found it pretty easy, for the most part, to follow these guidelines as we have a soft spot for marine mammals. While having a polar bear claw from a bear no longer living might in some way be cool after a moments thought it is just not something I really want. Especially considering when I buying such a product I'm sending a clear message that people like me want to buy more, or go kill more polar bears and get their claws. If a polar bear made me choose between my life and his I would naturally choose mine, and then I would hopefully use every piece of his body. And it is more difficult when you're looking at some beautiful carvings out of baleen or other such products. I remember looking for a necklace for Sarah so I could give her an Arctic surprise when we got back home. I did not want to buy the whale products but there were very few made from anything but whale. So it does get more complicated and when the artist who made the piece is holding it before you, clearly in some ways needing to make a sale to the only group stopping in their community this year, you can feel a little bit torn. If my family needed food and my only resource was carving animal bones I would probably become pretty good at it. Judge us if you will, but morality aside and following all laws, Sarah and I left the Arctic with only two animal based products and they were both caribou. Feel free to judge as I certainly held contempt for a few passengers who did not follow the same standards and proudly boasted about purchases that made my skin crawl. In a picture above Sarah is seen holding one of the caribou pieces with the artist herself, which is pretty darn cool. The piece she is holding is made from caribou antler and depicts an Arctic fisherman including a dangling hook! We love it. The lady with the baby! A common sight in any community we visited, the women have these amazing coats with giants hoods designed to hold children and keep them warm. How cute and how dang cool! There will be a few more pictures of these children as Sarah asked almost every woman wearing one of these coats if we could take her picture. Super long post I know, but I did not expect to get into the whole animal product thing. After we left our wonderful stop at Igloolik we take our trip all the way to September 4th. We are moving right along! The following day we made one little stop at a place called Barrow Falls. 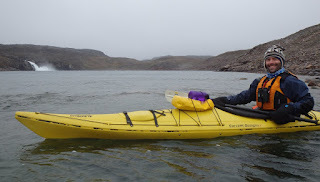 While most people were jumping into zodiacs fully geared up for the cold, the kayakers zoomed off in our private zodiac in our drysuits with our kayaks in tow. This was one of the good days to be a kayaker as when the tide dropped we were able to make it up a river the zodiacs no longer could. Tides can drop or rise up to fifteen to thirty feet in the Arctic and it is not always easy to predict exactly when or how quickly it will happen. It was quite the experience for the kayaker. The zodiacs had to turn back for a short land excursion while we were able to press on through what had now become a shallow rapids upstream. Super fun! While exploring we came to the point when Becs, our New Zealand kayaking guide and certainly one cool gal, told us we needed to head back especially since our safety zodiac had to wait on the other side of the mini-rapids. That's when Peter said exactly what I was thinking, "Can we go peek around that corner first?" Becs agreed and we went just a little bit further, and as with most explorations, it was that last stitch effort that made all the difference! That second picture of me kayaking is taken in front of what we saw when we came around the corner - a massive Arctic waterfall! Wow. And then yes, that night our expedition leader came on the intercom and told us there were some Northern lights or Aurora borealis starting to give us a show if we wanted to head up to the deck on top of the boat. Our photos are super grainy but with advice from Acacia I think I almost have about the best photos of this phenomenon we could capture. Maybe. It did not, however, capture half of what we actually saw that night. They turned off as many lights as were safe to shut off and then we watched as the night around us slowly came to life. Greens with mixtures of some blues and reds started mystically waving and dancing above us. At first we were excited to see them at all but as the display of lights grew we became entranced to some degree by what looked like an invisible ocean just above our heads slowly becoming more visible by the moment. They looked as if we could touch them and I could feel a deep part of myself understanding some unspoken truth. The part of me that understands the basics of solar flares and colliding gas particles allowed itself to be temporarily suspended. I embraced the raw mystery and awe of the lights, letting myself be taken into a moment complete stillness. Joy is what I felt. How had I come to that moment? Deep in Arctic waters and seeing what I found out later is one of the best displays of Northern lights most of the staff had ever experienced. I pushed the question aside, glanced at the love of my life by my side. I put my arm around Sarah. We were together. Our oneness was never more apparent to me than on that deck surrounded by others. Others who blurred into nothingness. We both just snuggled close and let the lights wash over us. Click on this link for way more photos of the trip than you would ever want to see - in other words, click her mom!